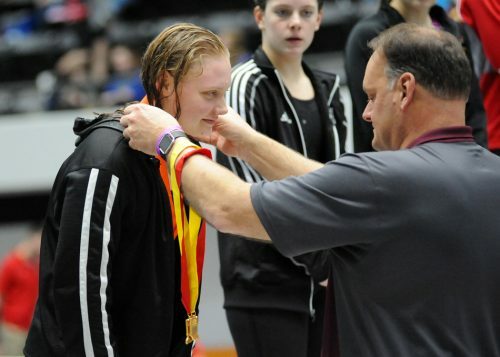 INDIANAPOLIS – It was a fine ending to the careers of a pair of locals competing in the IHSAA Girls Swimming State Finals. 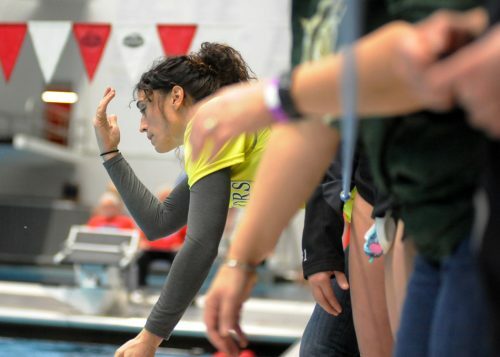 Wawasee’s Paige Miller and Warsaw’s Brenna Morgan both claimed a pair of podium finishes to close out their prolific high school careers Saturday afternoon to highlight the lone finals appearances from both schools. Miller, who came into the state weekend seeded first in the 500 freestyle, would place sixth in the long distance shootout with her time of 4:58.07, a little short of her qualifying swim Friday night, but a relief from four years of fighting in what has become sub-5 or bust. Miller saw the 200 free earlier in the meet as a bonus, and came away eighth overall with her 1:51.72. 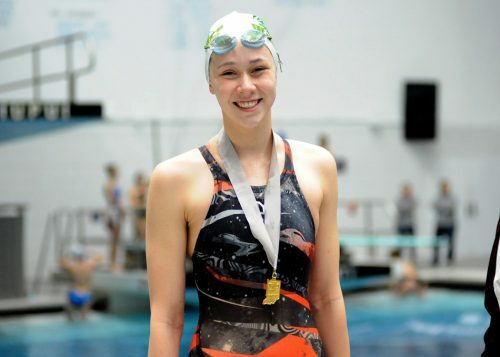 The journey to state, and ultimately, closing out her high school career was just icing on the cake with two medals wrapped around her neck. Morgan, after needing to swim for her championship life Friday in a swim off just to qualify for the finals, admitted to swimming a little tight in the 50 and took sixth overall at 23.67. Just making it to the finals was gratifying for Morgan, who didn’t know what to make of her transition from prelims to finals. “There wasn’t a lot of time for the swimoff last night, I just had to turn around and do it,” Morgan said of Friday night’s unique scenario. The difference between that and having a week to think about a race, or even a day, is huge. It was just something I had to go out and do it. In the 100 finals, Morgan looked possibly too comfortable from the outside lane two, keeping with traffic but not making many moves. As Warsaw head coach Tony DeBrota tried to will his stud senior along, Morgan stayed just outside the wake of the inside lanes. Her push at the finish got her to sixth at 51.60, and a second sixth-place medal. Brenna Morgan receives her sixth place metal in the 50 freestyle finals. 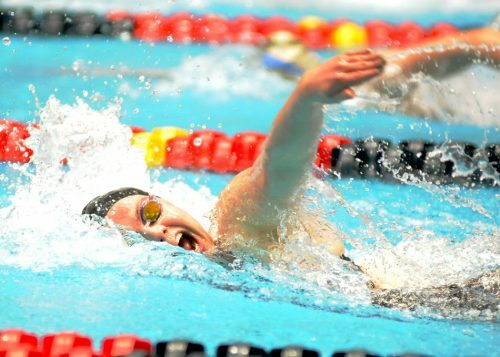 Northridge had two relays and one swimmer in championship swims Saturday afternoon, plus three divers. The Raider 200 free relay placed eighth at 1:36.91, and the 400 free relay closed out the day in seventh at 3:31.15. Katie Hughes, who started her day with an 11th-place time of 1:51.95 in the 200 free relay consoles, came back with a vengeance in the 500 finals. While Emma Nordin of Carmel was running away with the championship – a blistering 4:45.32, Hughes was pacing the remainder. In the final 25 yards, Hughes would slip to third overall, but pulled a 4:54.06 which set the Northridge school record. Northridge’s diving trio of Sara Troyer, Rylee Dahlman and Mary Grossman took three of the top 12 spots. Troyer led the pack with a third-place set of dives to score 487.00 points, complimenting her sectional and regional championships. Dahlman was 10th with 438.15 points and Grossman, who just made the cut in 16th place in the morning qualifiers, moved up to 12th with 428.20 points. Concord’s Lauren Boone missed the cut in the final try of her stellar career, taking 17th place with 297.15 points. Ivy Houser of Hamilton Heights won the diving title with 535.80 points. 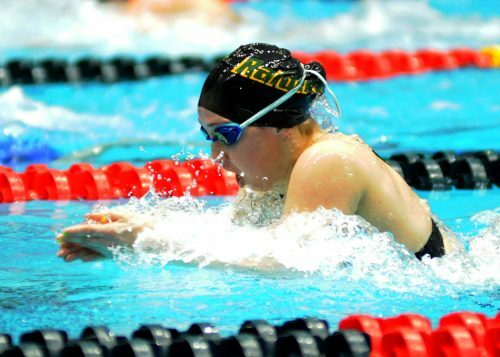 Wrapping up consolations from Northridge swimmers, Sydnee Emerson took 10th place in both the individual medley (2:03.44) and the butterfly (56.48), Lauren Miller was 11th in the backstroke (56.44) and the Raider medley relay was 13th (1:47.06). Elkhart Central’s Sydney Dygert placed 13th overall in the butterfly with her consoles time of 56.77. It was Carmel’s chance to shine for a 31st straight year, extending its national record of team championships with its blitzkrieg once again. The Greyhounds won all three relay, the medley at 1:41.23, the 200 at 1:33.01 and the 400 at 3:19.10. There wasn’t an event sweep by Carmel, but it had five individual champions, led by Nordin’s 500 title and her other in the 200 freestyle at 1:47.08. Sammy Burchill set a new state record in the IM at 1:56.67, Trude Rothrock won the fly title at 52.97 and Kelly Pash took the 100 free title at 49.41. Bloomington South’s Grace Haskett was a double winner in the 50 free at 22.77 and the backstroke at 53.38. 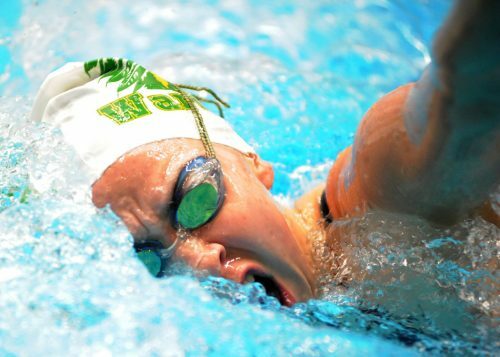 The other record to fall Saturday came in the breaststroke, where an emotional Emily Weiss of Yorktown was the runaway winner of the event with the new standard of 59.37. Lauryn Parrish of Fishers was named the Mental Attitude Award Winner. Wawasee’s Paige Miller stands proud after placing eighth in the 200 freestyle finals. Wawasee head coach Julie Robinson tries to will Paige Miller along in the 200 freestyle. Northridge’s Katie Hughes was third overall in the 500 freestyle. Northridge’s Sydnee Emerson competes in the IM.